Last month we had a FitBit walking competition. The person with the most steps in 4 weeks would walk away the winner. I decided to go all out and win by as many steps as I possibly could. Before the competition I averaged around 5,000 steps per day. And during, I averaged about 30,000. 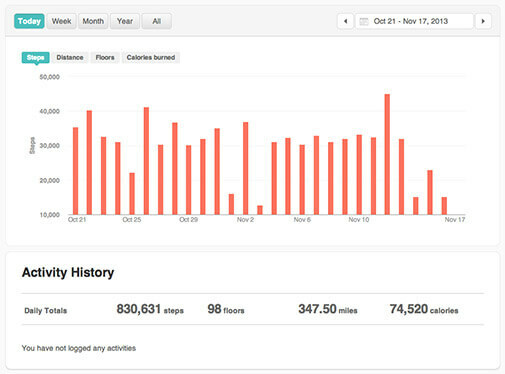 In 4 weeks I racked up 830,631 steps and took first place! Even though it wasn’t running, I definitely pushed myself. I spent most of my free time walking and even walked the 9 miles to work a few times. It was exhausting and my feet weren’t happy with me, but it was really fun. I’ve been taking the past week off, but I’m excited to get going again! This entry was posted in 30 before 30, health, my life. Bookmark the permalink. I am tired just hearing about your efforts! Keep up the good work! Your post on 30 by 30 was one of the first I read when I started blogging. Glad for the update!